There is a thing about writing on a digital medium, it allows you to erase your mistakes and move on, a privilege which is not available to you when you write on a blank sheet of paper. However, if you look at it again, you might feel, it is not much of a privilege either. It is sort of an unseen disadvantage. The digital medium lures you to see your little trashy piece of writing as a great piece of art and ask you to make little delicate changes i.e., grammatical changes, spelling changes and all other sorts of changes. The temptation doubles up if you are not a native speaker of the language. With digital medium, you constantly search for better words, you constantly distract yourself with all those new grammar rules, and you constantly end up killing your time. 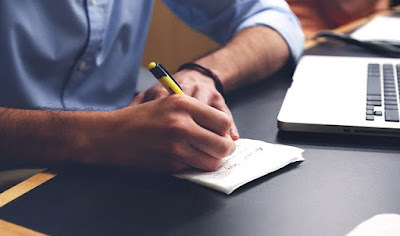 On another side, when you are writing on a B-5 sized white sheet of paper, there is no such distraction, you are in command of your story or article or whatever you are writing down with your black ink fountain pen. On paper, you also don't have an urge to rectify your mistake. They are just there as a reminder of your mistakes and need to improve, a privilege which is not available to you when you write on a digital medium.